We’ve lived in Portland for fifteen years and for most of that time I’ve walked past this door every day on my way to work. Except I can promise you I’ve never walked past this door, at least not until a few days ago when it caught my eye. I’ll grant you I’m not the most observant person, but even so I know I haven’t walked past this door. And I haven’t. 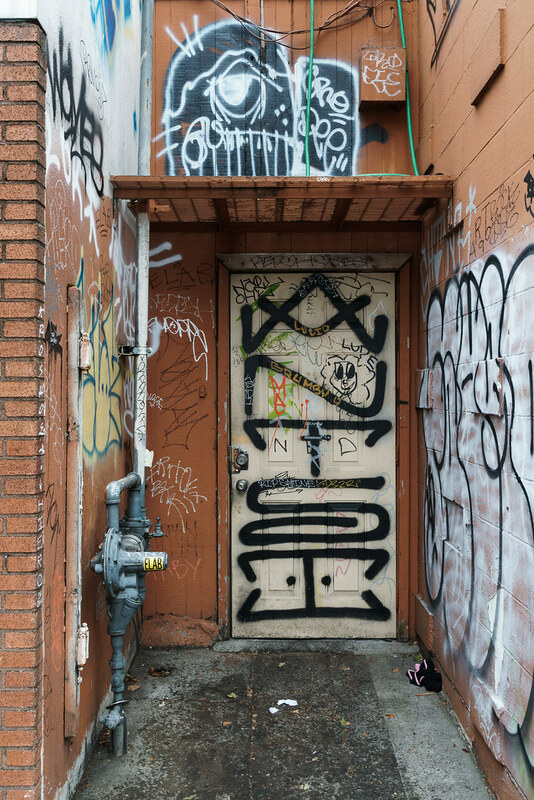 I found a picture online from last summer that showed the graffiti wasn’t present then, it was a beige door in a brown building, tucked in a little cubbyhole between businesses on Broadway, the door I had walked past for so many years. I made a point to photograph it as soon as I could as it will soon be dark in the mornings, and who knows, maybe beige and brown too. This entry was posted in Street & Travel and tagged graffiti, Irvington, Oregon, Portland. Bookmark the permalink. I noticed this morning, after not walking past the previous week, that the door had been painted over. I can’t blame them, I’d have done the same, but I’m also glad I got the photo when I did.